Last resolution for 2017…Be Intentional. In praying about my resolutions, I realized that one of the reasons why I am not as intentional with my family as I could be is due to my lack of planning and too much unfocused time. Sometime I get a little ADHD and bounce from one activity to another. Also, I find that I am continually looking for notes I have written on various scrap pieces of paper. I need to get a plan and follow it. But have you seen all of the planner options on Amazon and Pinterest? It is overwhelming. So I headed to the ABCJLM Facebook group to find out everyone’s favorites. To my surprise almost everyone gave me a different suggestion! Author and ABCJLM momma Sarah Kovac suggested the iBloom Life and Business Planner. And I am really glad that she did! While I believe a planner is a very personal decision based on your likes/dislikes, I want to share how I am using iBloom and tying it to my goals. 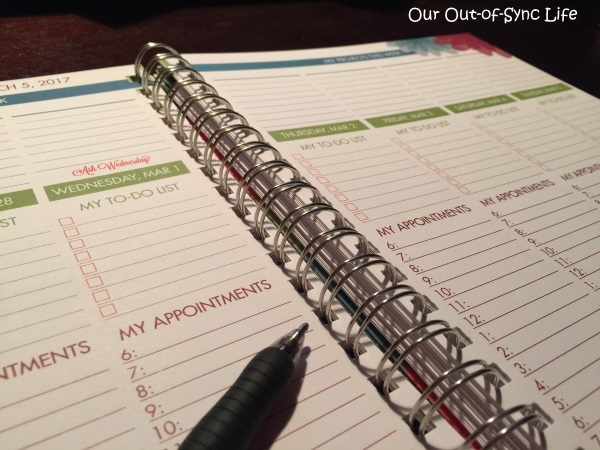 The iBloom planner begins with goals that work down to your daily activities. I love this top-down setup because everything I do is based on what I desire to be doing instead of my activities trying to dictate my values. The first few pages provide space to evaluate your current situation. What is going well? What is not? What needs to change? From there the user creates goals and a vision for the year which then leads to projects you want to see completed in 2017. After thinking through your year, it is time to break your plan into the first month’s activities. 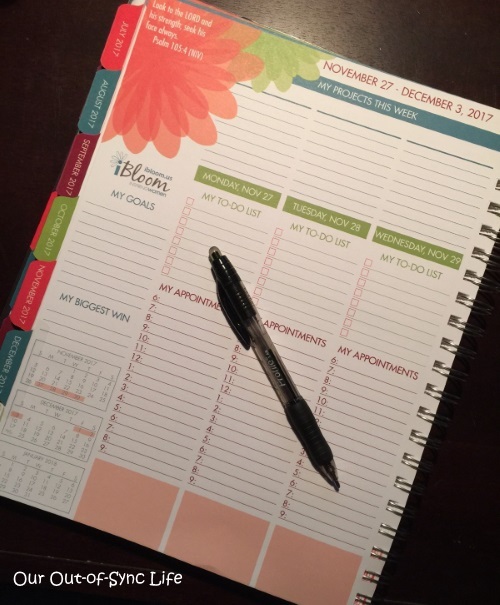 While this planner is geared toward business people, it can easily be used to focus on goals for yourself or your family. And while I don’t consider people “projects” this could be a place to make a plan for areas you want to guide each child (improve reading, social skills, etc). A lot of flexibility. In just the first three weeks of using the iBloom planner, I see a difference. I’m better focused and accomplishing more. By placing different family activities on my appointment schedule, there is no temptation to do something else. I’ve also seen my stress level go down because I am not trying to remember everything in my over-saturated mind. All this to say, I have more time to devote to my family! While investigating various planners I seriously debated creating a Bullet Journal. But the thought of drawing 28-31 squares each month to create a calendar seemed time consuming and would mess with my perfectionism. But I did love the symbols used to keep your to-do list on track (image above). 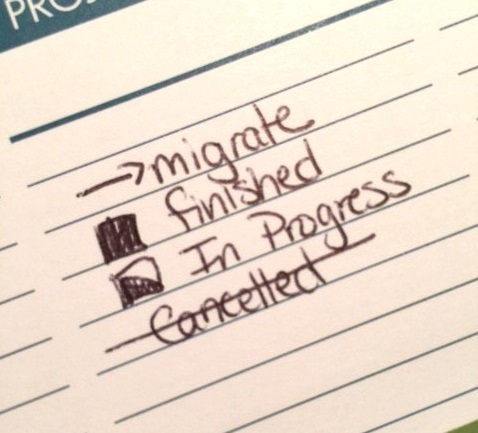 Migrate (the arrow) means that the task didn’t get finished so I need to add it to the next day’s activities. I also added a few of the Bullet Journal layout ideas by creating a weight loss and workout tracker. I added these to the Notes section in the back of the planner and the Weekly Projects pages. These habit trackers are helping me reach my goals! You could add trackers for 10,000 steps, water consumption, having a quiet time, etc. No matter what your goals are iBloom is very flexible and there are a gazillion ideas on Pinterest to personalize it to your needs. Above is a picture of the 1st page of the spiral-bound book. This key verse is woven throughout the entire planner. I love how the Message translates Romans 12:1-2. Each week includes a Bible verse. The monthly goals and planning hold me accountable to what is important to me. The flower decor in the journal reminds me that I am to bloom where God has planted me. For me, this planner has been a win! 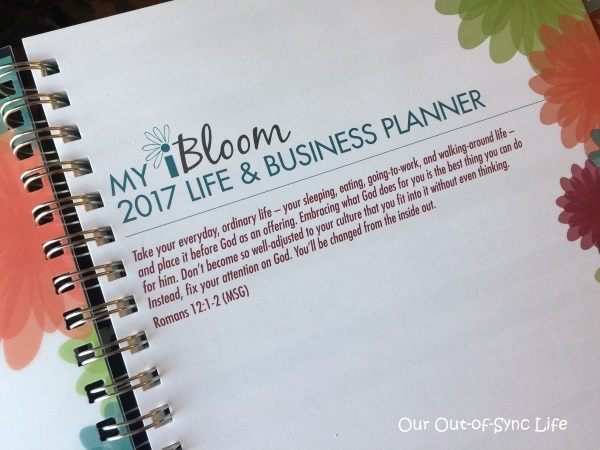 iBloom is helping me stay focused, reach my goals, and keep Christ the center of my day. Want to give iBloom a try? Order now or if you want to give it a trial run, iBloom will gladly email you a sample week. Plus you will receive links to videos explaining how to use iBloom to the fullest. 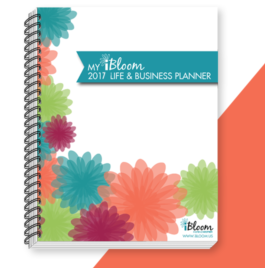 Even better you will receive a coupon code to order your own iBloom planner! Thank you to iBloom for allowing me to review this product and share my honest thoughts.